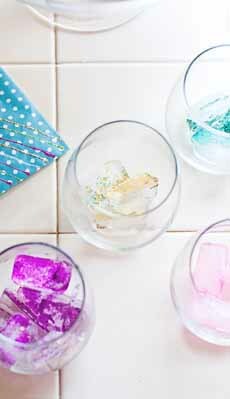 Generate oohs and ahhs with glitter ice cubes (photo courtesy A Subtle Revelry). Topping ice cubes with edible glitter: We love this idea from A Subtle Revelry. It’s spot-on for New Year’s Eve or any holiday of the year, plus celebrations like birthdays and festivities like the Super Bowl. For sparkling wine, ginger ale, water and other light-color drinks, it’s easy to add glitter to your glass. You can use them in darker drinks, of course, but they show best when light refracts through them. Here are step-by-step instructions (which can be summed up as “make ice cubes” and “top with glitter”). If you don’t want to use ice cubes—in the sparkling wine, for example—you can use the glitter as a glass rimmer. In addition to sparkling glitter in some two dozen colors, there are gold stars, and dozens of other shapes and colors. Just check out these options. Just make sure what you buy is edible (see the next section). Edible glitter is made from starch-based food products that can be digested by the body. “Non-toxic” glitter may sound safe, but it isn’t edible: It is manufactured from plastic and is not digestible. It’s essential to buy the edible kind. The FDA advises that even if you see the item for sale at a bakery supply stores, check the label. Even baking supply companies sell the non-toxic kind, to be used for decorating plates and other non-food purposes. Don’t let the name fool you, either. Products names such as luster dust, pearl dust, sparkle dust, twinkle dust, shimmer powder etc., may sound edible. And online blogs and videos may promote their use. But unless the product says edible, it isn’t. Here’s more about it from the FDA.